This beautiful strawberry summer salad recipe wasn’t really planned but sort of happened, when I was in the kitchen the other day. Because when it’s summer there are loads of yummy ingredients such as fresh fruit and veggies in my kitchen. I just love this season. I love the fact that you can buy local stuff in the supermarkets. Fresh Danish fruit and berries and so many different local Danish vegetables. Because I didn’t plan this recipe, unfortunately I didn’t write the exact recipe down, while making it, so see this more as an inspiration and add as much of the ingredients you like. But remember to be generous with the strawberries! They really do the trick! I’ve used a very traditional Danish smoked cream cheese for this recipe. I know, it’s almost impossible to get a hand of outside of Denmark, but you can easily substitute it with the Italian burrata cheese, a classic buffalo mozzarella or just plain Greek feta cheese. It’s your call. However, if you ever visit Denmark, make sure to taste the Danish smoked cheese called “rygeost” in Danish! It is typically eaten with radishes and taste amazing. 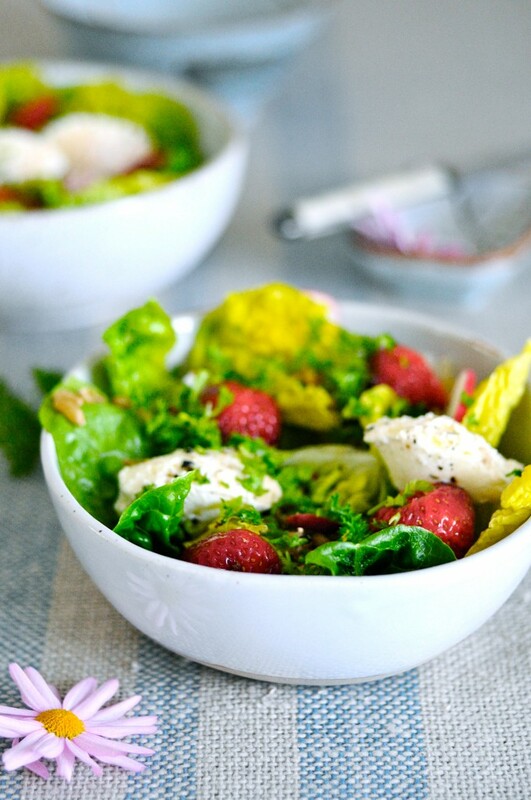 Super easy strawberry summer salad for the busy week nights. 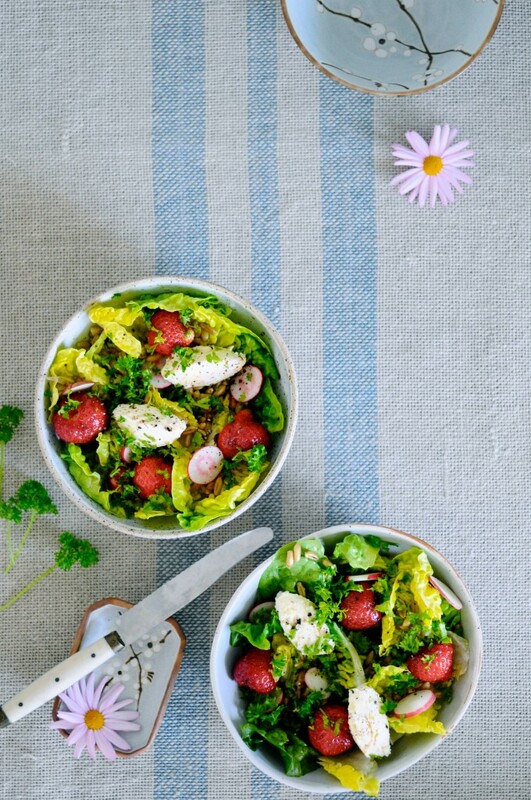 Use any cheese you like for this summer salad! Rinse the salad and chop into large pieces. 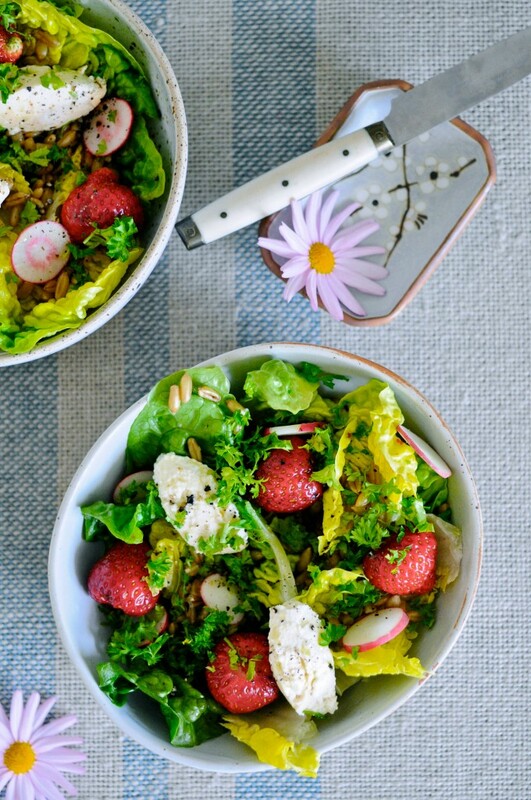 Slice the strawberries and radishes in half and gently mix them with the salad. Pour olive oil and lemon juice over and sprinkle with roughly chopped parsley. Finish with dollops of smoke cheese on top.